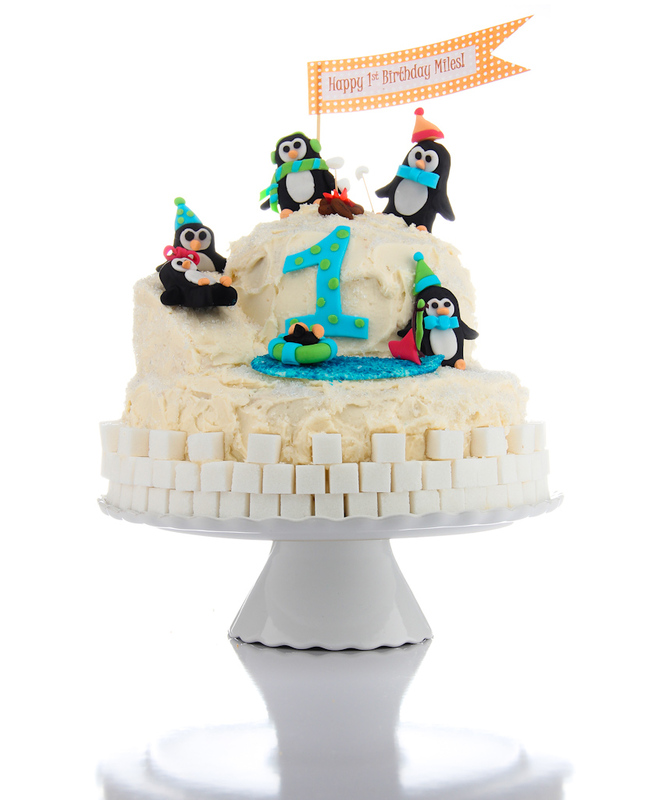 It was snow much fun making this Winter Onederland to celebrate my nephew Miles’ first birthday! I was a little nervous with my friend Tim coming to join in the cake decorating fun, because let’s be honest, there is really only room for one chef in the kitchen, especially one as small as mine! It turns out… we actually work pretty well together! I think this cake adventure was even disaster free. Definitely apply a thin crumb coat to your cake before icing, especially with white icing. I recommend refrigerating the cake for 15-20 minutes after applying the crumb coat, to provide time for the icing to set. Sugar cubes are amazing for winter wonderlands: ice blocks, igloos, snow, the opportunities are endless! Insert a toothpick in fondant figures to secure the figures in place on top of a cake. 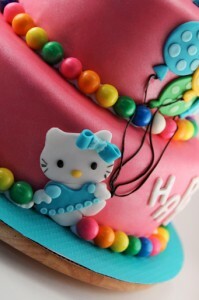 In order to minimize the mess, add sprinkles immediately after icing before the icing has opportunity to set. Confession of a *wannabe* foodie….. While I always make homemade icing, I occasionally , okay frequently,cheat on the cake and filling, if I am decorating a cake. Before I started decorating cakes, I had no idea you could buy pudding in cans, but it turns out that canned pudding is pretty fantastic as a cake filling. Italians eat lentils in celebration of the New Year. The small round legumes resemble small coins and symbolize wealth and prosperity. The more lentils you eat, the more wealth and prosperity you will experience in the coming year. I love lentils, I love tradition, and I will share my favorite tasty lentil soup recipe on the first day of the New Year. Today, however, I celebrate the end of 2012 and initiate an amazing new tradition… caramel popcorn. I hereby decree I will consume these crispy, crunchy, clusters of golden goodness each New Year’s Eve to symbolize my sweet successes of the past year and the golden opportunities that await in the year ahead. Try this. You will not be disappointed. You can be good next year! 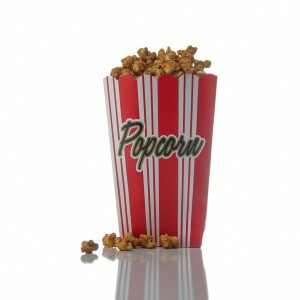 Confession of a *wannabe* foodie… This caramel popcorn is highly addictive. It may be more addictive than Cheetos. Consider yourself warned. For the love of blackberry…. and lime. It is a happy day, a true sign of summer, when berries dominate the fruit display at the grocery stores. Hoards of strawberries, heaps of blueberries and mounds of raspberries, but blackberries? Where are the blackberries and why are they always in those teeny-tiny containers? This summer we are participating in the Fresh Gatherings Harvest, a community supported agriculture (CSA) program run through the nutrition and dietetics department at Saint Louis University. We purchase our “share” (or half-share; $17.50 per week) at the beginning of the season and receive our “product” (produce) throughout the spring/summer/fall. This is an incredibly easy and convenient way to purchase seasonal fruits and veggies from local farmers. In a quick 5 minute stop, we have a crate full of produce for the week and the backbone of a seasonal weekly menu! In addition, the crate often includes fruits and veggies that I might not normally find or buy at the grocery store… like blackberries! 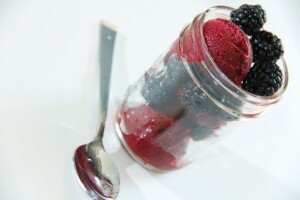 While the blackberries rarely last a day in our house… I resisted all temptation for the love of blackberry and lime sorbet! 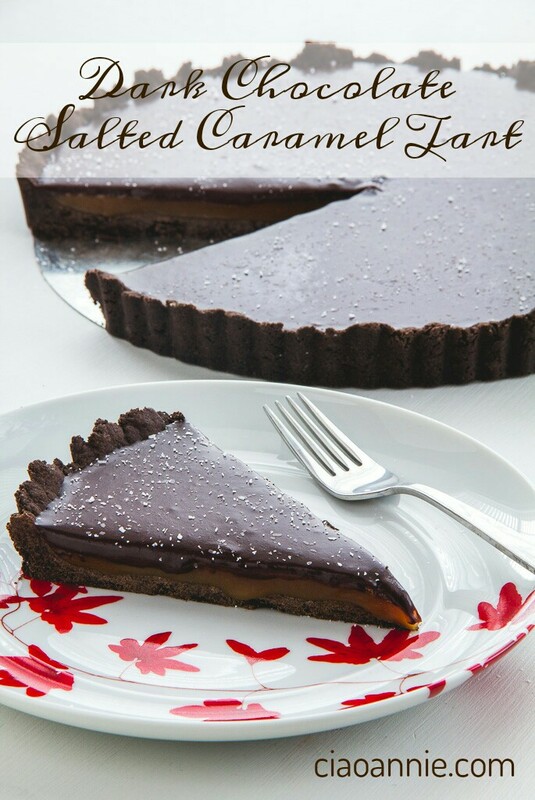 Tart, tangy, and tasty… this is a perfect summer treat! Confession of a *wannabe* foodie… I consider it a miracle when the blackberries survive the ride home! Who knew the most challenging mission of this cake would be to locate and acquire gumballs! 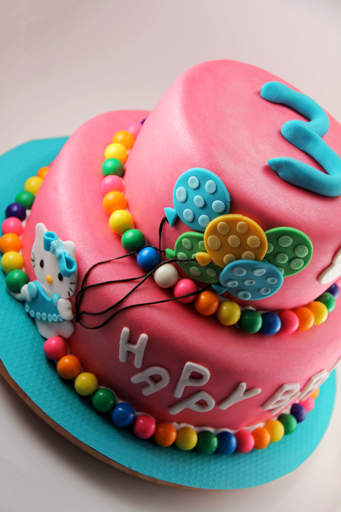 Once gumballs were included as part of the mission, however, they could not be removed, as they were now an essential element in the cake completion. Fortunately, my mother and sister voluntarily enlisted in the overt gumball operation. Three stores and several phone calls later, a large box of gumballs appeared, concealed in a Dierberg’s bag, between the side door and screen door of our quaint brick bungalow. With the success of the overt gumball operation, it was time to move on to the next phase of cake completion. Pink pearl dust, applied with a paint brush (clean, and cake-specific, of course), provided the perfect pink sparkle to make this cake Elise approved. I intended to make this cake over-the-top -sparkly with actual sparklers, but lost too much time with the overt gumball operation. Next New Year’s Eve, I plan to purchase several packs of sparklers to use throughout the year. Confession of a *wannabe* foodie… My free hand Hello Kitty failed, so I cheated a bit by creating my own Hello Kitty stencil by printing and cutting an image I liked online. I don’t consider myself a necessarily girly-girl. I love to camp, spend time outdoors, watch baseball and hockey, listen to loud rock and roll, love crime shows, etc. I have to admit, however, I seem to be missing the superhero gene! I appreciate a good superhero in the occasional movie or great costumes at Halloween, but if you ask me about Bruce Wayne, it may take a second before I figure out if you are referring to Batman or Superman. 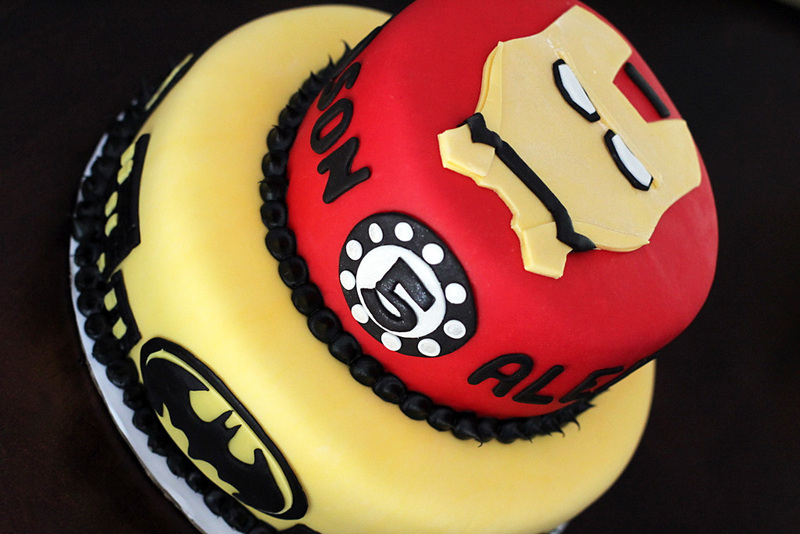 I am always up for a birthday cake challenge, so I thought I would attempt Mason and Alex’s favorite superheros: Batman and Iron Man. Despite my superhero ignorance, I am fairly confident with Batman. Iron Man, on the other hand, is where that ignorance returns in full force! 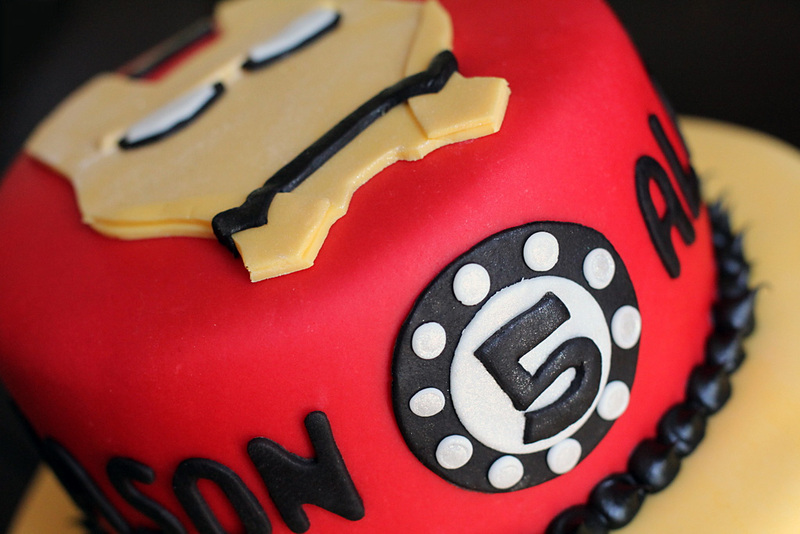 I tried my usual hot spots for cake inspiration: blogs, Google image searches, Pinterest, movie/cartoon clips, etc., but Iron Man continued to elude my creativity. This creativity block continued for several days and as the birthday approached, I began to fear that stifling creativity might, in fact, be Iron Man’s ultimate super power. I unleashed a few of my decorating superheros, and the gold and silver pearl powders ultimately saved the day by kicking up the Iron Man mask and power supply. I welcome any suggestions for future superhero cakes! It can be difficult to find that delicate balance of awesome… that remains within my ability to execute! Confession of a *Wannabe* Foodie… Boxed cake mix, layered with pudding, and frosted with homemade icing can be pretty fantastic and great for kids’ birthday cakes. The kids get way more excited about the decorations than homemade cake! My loving, sweet, adorable husband does not like chocolate. Under the circumstances, I believe it is even appropriate to say that he hates chocolate. He dislikes chocolate so much that he does not eat anything with chocolate in it… except for Mexican Mole! After almost four years of marriage, however, I determined there are a few surprising benefits (okay, two) to a non-chocolate-eating husband! 1. There are many circumstances in which I am *forced* to eat 2 desserts; it is only polite. If dessert at a certain dinner or event, for example, happens to be chocolate, I politely devour mine and then do a quick switch of the plate when no one is looking to politely finish Allen’s dessert as well. 2. 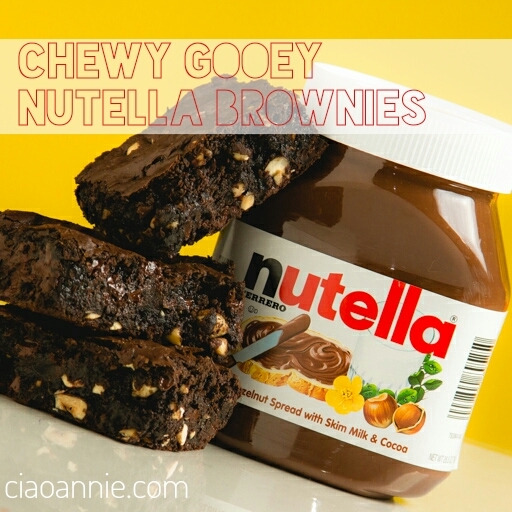 I explore and test a lot of amazing non-chocolate desserts, which I might normally overlook! 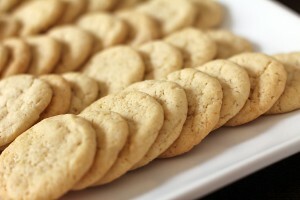 These homemade vanilla wafer cookies are a fantastic example of a cookie I might never have tried if it were not for my chocolate-fearing husband and my heightened awareness of non-chocolate eaters. These delicate, crispy, vanilla bite sized cookies will definitely make you think… what chocolate chip cookie?!? Confession of a *wannabe* foodie… Although I do love to harass Allen for his disdain of chocolate, I do love all the non-chocolate desserts we discover! When was the last time I actually ate an oatmeal cream pie?!? Why would I want to bake a homemade version of a pre-packed vending machine snack?!? 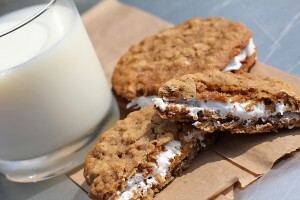 Just take one look at that ooey gooey oatmeal cream pie and trust me! The past few years, I have helped with a retro bowling fundraiser for Guardian Angel Settlement Association (GASA), an amazing organization in Saint Louis that serves the poor by helping them improve the quality of their lives and achieve economic independence. In addition to raising money, this event is a wonderful opportunity to get together and celebrate such an incredible organization in the Saint Louis community. You know it’s a pretty fantastic fundraiser when it includes, all you can eat, drink, bowl, and shoot pool at an old school bowling alley that requires you to keep your own score! The event is held at Saratoga Bowling Lanes, in operation since 1916, and supposedly the oldest bowling alley west of the Mississippi. I thought it would be fun to contribute a retro dessert buffet, and where better to start than with the original Little Debbie Snack Cake… the Oatmeal Cream Pie. 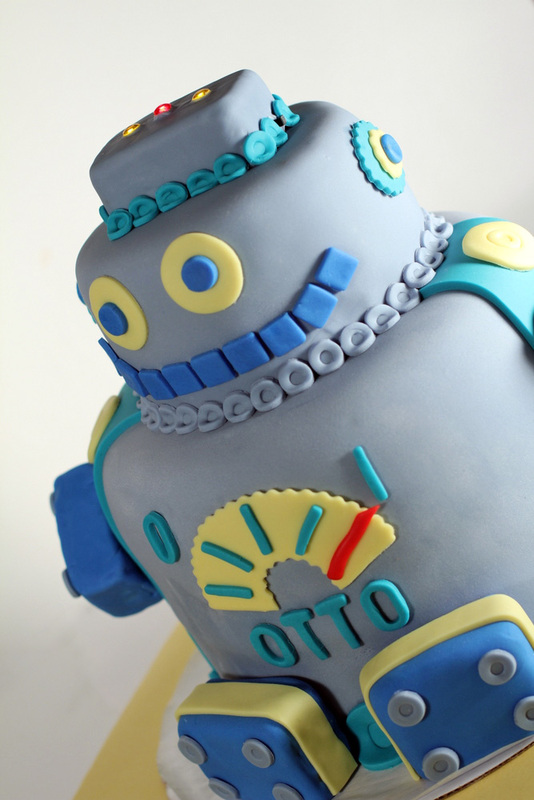 I started drafting a few cake ideas for Robotto Otto’s first birthday when my husband Allen nonchalantly mentioned that I could not make a robot cake without some electronics! My knowledge of circuits, however, ended with grade school science. Needless to say, we decided to divide and conquer. I added the lights into the cake design and Allen headed off to RadioShack. Allen created a series circuit with three LED’s, two nine volt batteries, a switch, a bunch of wires, a project box, some solder, and a bit of electrical tape.